I don’t own the tape (and the picture you see here is from another tape), but I made a CDr of the eight tracks on it, before i returned the tape to the guy who lend it to me. He offered me to buy it, but i could not afford it. 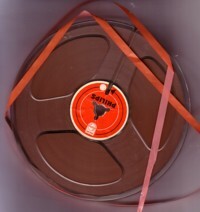 It was a small tape recorder tape in a carton box with a brown piece of paper in it, on which in orange letters some information was printed in a typewriter font. 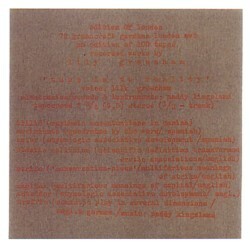 The title of the tape is Tune in to reality and the tape was released in an edition of only 100 copies. The artist is Lily Greenham and she recites poetry or something like that, sometimes backed up by a band and/or electronic sounds. It liked it because of the esoteric content of some the songs or poems. I was given this tape ten years ago, and in that period I hardly knew anybody who was interested in music that did not come from vinyl. On the CDr’s that I made for my snobbish record collecting friends, to show them what they were missing, I often used tracks from his tape. Later I learned that she was not a real outsider, as i thought she was, but a well respected artist, that released more recordings than this tape, which came out in 1973, by the way. Not that this is important, I rather follow my ears than my knowledge. All the eight tracks on the tape are good, but Outsider is definitely my hit on this tape.